From modern literature to the oral tradition of ancient bards, humankind has told stories of bears. Bears are revered for their strength and self-reliance. Many cultures hold the bear, Ursus, as a sacred spirit animal. 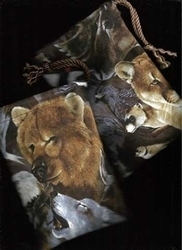 If the bear is your power animal or totem, then this is the tarot bag for you. Because brown bears fill this fabric, each bag will have a different positioning of the animals. 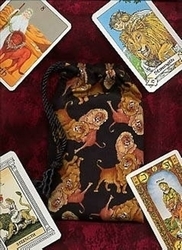 The background of each tarot bag is black and the bears are illustrated in various shades of brown from beige to golden to chestnut. Bear Symbolism: The bear features prominently in many Native American spiritual traditions, and represents many different (often contradictory) aspects of being. 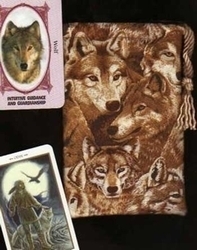 As a strong grounding force, the bear represents strength and the warrior spirit. Mother bears fiercely protect their cubs when threatened. 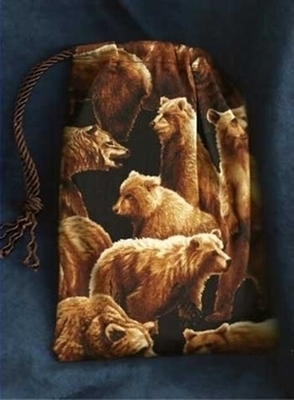 At the same time the bear symbolizes peace, solitude, and tranquility. 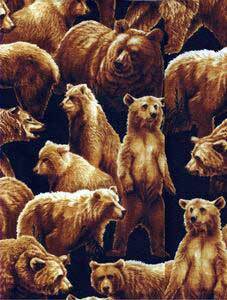 Typically solitary creatures, bears show us the wisdom of introspection.